Bicycling has seen a resurgence in popularity recently — especially among baby boomers. For many seniors, recreational bicycling is the perfect way to get outdoors, explore the area, and get some exercise. Finding the best bikes for boomers can be tricky, though. When you go to pick out yours, here are a few things to keep in mind. Recreational biking should have a positive impact on your health and happiness. To make that happen, choose a bike that is comfortable for you. The best ones offer great shock absorption, take pressure off your perineum, and allow you to sit up or even lean back. For these reasons, you may want to consider a bike with high-rise handlebars, wide tires, and extra padding. Everything from the seat fabric to the saddle width and height can make a huge difference in comfort. Most people choose between a mountain bike and a road bike, depending on whether they plan to go off-roading or stick to bicycle lanes and sidewalks. However, seniors have more to consider than where they plan to ride. Depending on your specific health needs, there are several options tailored more towards baby boomers. For instance, a recumbent bike offers superior back support. A step-through bike makes mounting and dismounting much easier, as does an easy boarding bike. The Day 6 bicycle features a seat back and several seat configurations to allow for greater comfort, while an adult tricycle increases stability. If you live in a small space, a folding bike may be necessary for storing and transporting your bike. 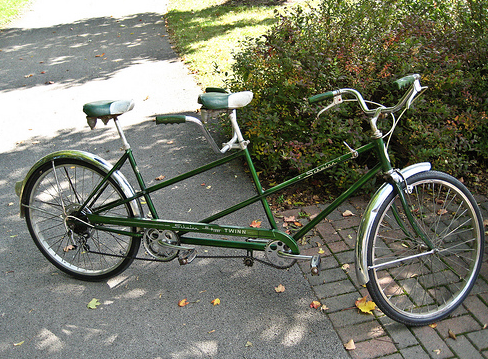 Couples who plan to ride together may value the romance factor of a tandem bicycle — better known as "a bicycle built for two." Speaking of unconventional bikes, have you considered an electric bicycle? Also referred to as "ebikes," electric bikes can be a great option for seniors. Those who live in hilly areas, especially, will appreciate the addition of an electric motor. You can still pedal just as you would on a manual bike, but with an ebike, you have the option of letting the motor take over when you get tired. Even if you don't plan to use this feature regularly, it is a good safety measure to avoid getting stranded. The best part is that as ebikes have become more advanced, more styles and options are available, including folding and step-through ebikes. Of course, there are other things to consider, as well. Price is not an insignificant factor. Safety and upkeep should also be taken into account. If you only plan to use your bike recreationally, you may not want a bike that requires much maintenance. Balance, ease of mounting, and back support will all be more important now than when you were younger. You should also think about where you plan to ride and how you will get your bike there. As more baby boomers retire, we expect bicycling to become an even more popular pastime. Before you hop on, get your spouse or a few friends to pedal with you. You'll appreciate the company and sense of community — as well as the extra motivation on days you would rather stay at home.